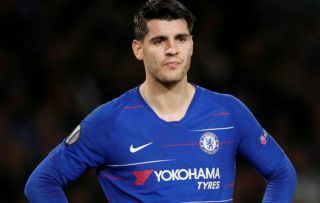 Chelsea striker Alvaro Morata is now reportedly just ‘one step away’ from a transfer to Atletico Madrid, according to a report from Calciomercato. The Italian outlet state there are just a couple of hurdles to be completed now for Morata to become an Atletico player, as talks to bring Gonzalo Higuain to Chelsea as his replacement also supposedly accelerate. Morata has flopped in his time at Stamford Bridge, so fans will be delighted at the news that the Spain international’s time with the club finally seems to be coming to an end. Calciomercato do not make it clear, however, if this is still going to be a loan move, as has been widely suggested, or if there’s a chance of a permanent deal being done this January. The Daily Mail also recently linked Morata with Atletico but suggested the deal could be in doubt due to the La Liga club’s reluctance to commit to a permanent transfer, so perhaps that has now changed. Either way, this sounds encouraging for Chelsea in terms of getting a player off their books who’s simply not been good enough, and hopefully allowing them to move a step closer to bringing in a quality replacement for such an important position.